I am surrounded by tulips here in the skagit valley – acres and acres planted to draw people to the tulip festival – I never get tired of their elegant beauty! Just wanted to stop by and thank you for visiting my blog. So pretty! Tulips are my favorite. What a gorgeous photo! I just adore tulips! I LOVE tulips, they're my favorite!! Those are beautiful! I love tullips. Did you know that they mean 'perfect lover'? SO gorgeous! I would love for you to check out my blog if you get a chance. God bless! 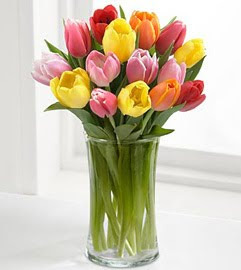 Oh Tulips are my ABSOLUTE fave!!! I love tulips – I'm so glad they're finally starting to bloom in Chicago. Beautiful! I love wordless Wednesdays! Such a much needed spiritual lift in the middle of a long week.